On Tuesday, the journalist whose lawsuit forced Chicago police to release video of the fatal shooting of Laquan McDonald was banned from a press conference that he inspired. Petty is as petty does. Brandon Smith, a freelance writer, told the New York Times he ran to the news conference as soon as he learned of it from colleagues, but police wouldn’t let him inside. The officers said the room was “too full to allow members of the news media without credentials.” Since Smith doesn’t usually attend credentialed events as a freelancer, he didn’t have one. But he doubts that was the real issue. “This wouldn’t be happening if not for my lawsuit,” he said. In August, Smith filed a lawsuit requesting police footage of the shooting of McDonald under the Freedom of Information Act against the McDonald’s family wishes. A judge ruled in his favor last week, ordering the clip released before Thanksgiving. Now Officer Jason Van Dyke, who shot McDonald 16 times in October 2014, has been charged with first-degree murder and remains in jail without bail. 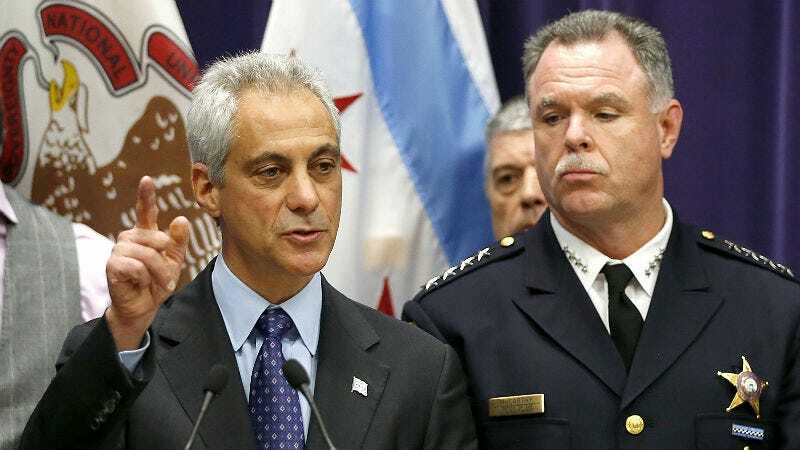 Banning the man who forced police to be held accountable for their actions is an interesting way to demonstrate the reform Mayor Emanuel and Police Superintendent Garry F. McCarthy promised in their petty presser.